It's my favorite time of year, Hungries! Sanctioned shopping season! I'm already well into it, having purchased my first gifts sometime last spring, but this is the feverish, frenzied time when all that delicious consumerism really amps up. I love shopping of any kind, but finding that perfect item for someone on my Christmas list, especially if it's a food item, really crisps my bacon. And just like every year, I have a few ideas for the food fanatic on your shopping list this holiday season. BHS would never let you down, lest you start calling me a cotton-headed ninnymuggins. 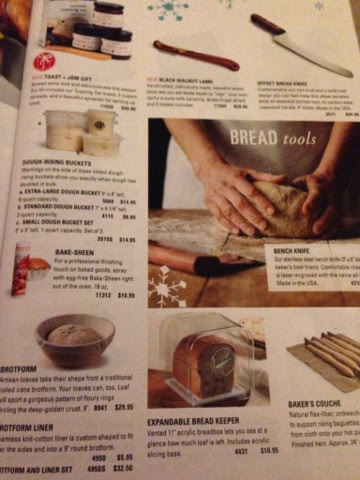 First up, I got this really cool catalogue this year that I really have no practical use for, as I can't bake to save my biscuits, but if you have a loved one who churns out breads and cookies with the best, check out www.kingarthurflour.com. The catalogue could absolutely outfit the pantry and cupboards of a baker's dream kitchen, with sourdough starter, cool bread crocks and brotforms, every hard to find flour, mix, grain, and flavoring you could imagine, plus fun canisters, utensils and accoutrements to pimp out someone's home bakery - at a fraction of the prices at Williams-Sonoma. 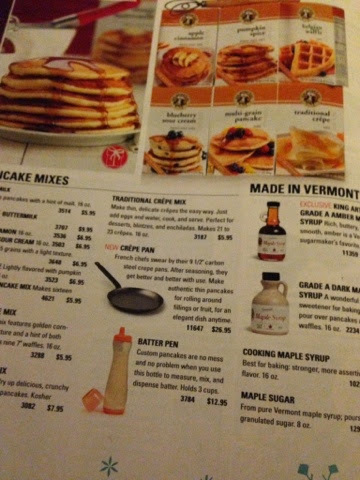 I don't bake, but this catalogue kind of made me want to try! I think I send you guys to Napastyle every year. I'll be scooping up their Parmesan dip and gray salt again this year for a couple food baskets on my list, but I think you need to check out their piggy plates and bowls. I have two of the small yellow bowls, and they were the hit of Thanksgiving weekend at our house last year. 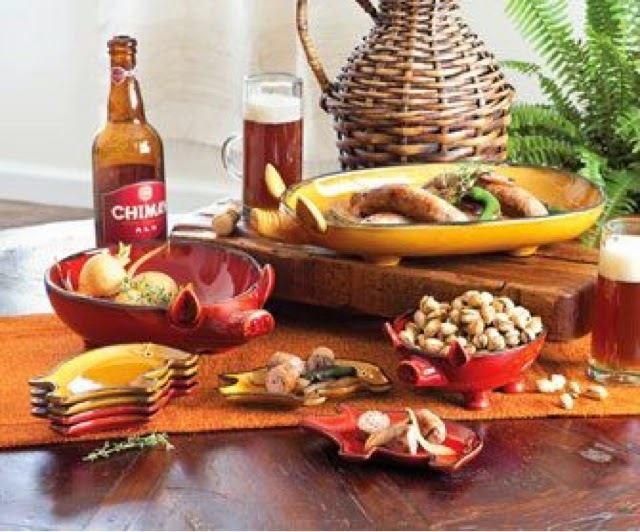 As pigs are my spirit animal, how fun to serve in these colorful crockeries? I'm not going to lie, I wouldn't mind expanding my collection of these myself. You plunk a ball of burratta down in the middle of that little piggy, and your guests will go wild. I haven't tried this next item yet, but I'm ordering a few bottles stat. 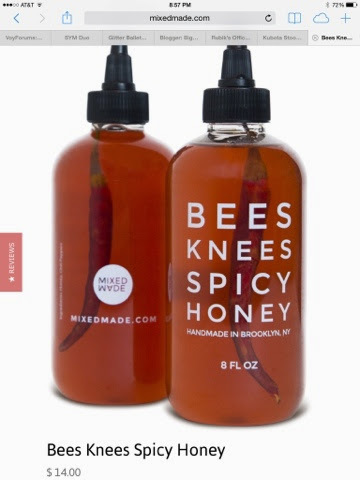 It's honey from the Hudson Valley of NY, kidnapped by some Brooklyn hipsters and infused with chile peppers. I'm dubious at best about hipsters, as you well know, but Mixed Made's Bees Knees could change my mind. Imagine spicy honey to balance the sweetness of homemade granola! Dream about it drizzled across savory bacon and Brie waffles! Fantasize about a hearty spoonful mixed into mango salsa on some fish tacos. I know, I know. I'm ordering mine tonight! I'm not a vegan, but I do enjoy chewing on a colorful turn of phrase that could get me into trouble. 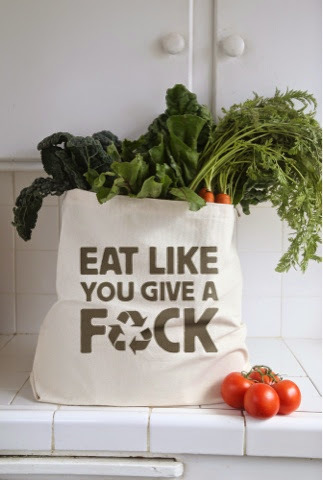 Enter Thug Kitchen, its new cookbook, which is full of fun profanity and vegan grub, as well as a really fun grocery bag I'd love to find under my Christmas tree. It will prove to everybody at Wegmans just how irreverent you can be about vegetables. I bought this tank top for my two college BFFs earlier this year, and it's now my go-to workout shirt. I like to wear something listing most of my vices while I sweat and do moaning. But I don't know your life. Maybe you'll wear it with a sequin skirt and go to the ball with the prince or something. You'll appreciate, in any case, its roomy fit and soft material. Find it at skreened.com. So, here's something weird: I decorate a small Christmas tree that I put in our kitchen each year with food ornaments and popcorn garland. Shawn thinks it's crazy, while I utterly love it. I think I would actually enjoy the holiday less without my food tree in my home. 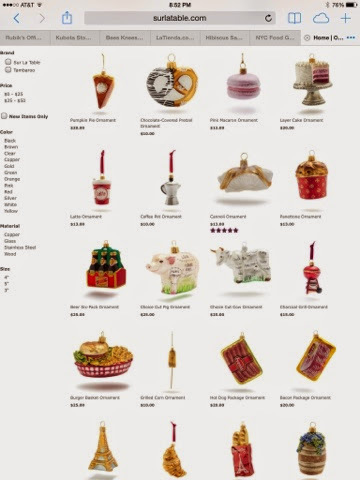 Most of the ornaments are from Sur La Table. Naturally, the porcine-related ones are my favorites, but if there's a coffee lover or croissant nut on your list, check 'em out! This next one is out of season, and I don't care. You shouldn't either. 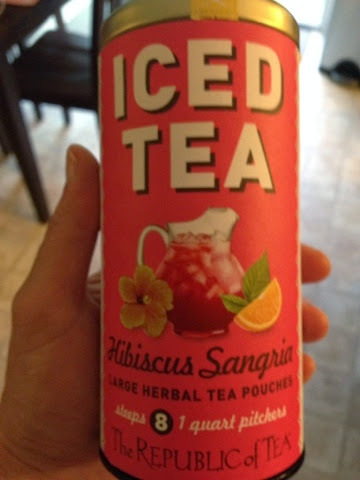 This hibiscus iced tea would make a great stocking stuffer. It's pink and therefore perfect for a girlie gift basket, and the pitchers of bright, hibiscus refreshment it creates will knock your friends' socks off. I drank it all summer, and bought about eight canisters of it before it sold out for the season, but you can grab a couple cans online. It is straight up my favorite iced tea ever. Share the yum. So there you go, folks. The holiday line up. I'm thinking a lot of these would make the foodies on your list squeal, well, like kids on Christmas morning. My hunger is big; my personality is bigger! I love those pig bowls. Hilarious. Love the iced tea too. I might need to snag that for next year's vacation. 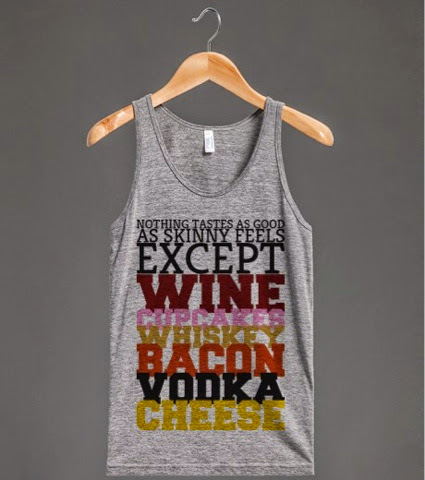 The tank top- YES! The iced tea! YES! I really do recommend Twinings Earl Grey and Blackberry brandy as a divine hot toddy! Warms from head to toe and is delish. 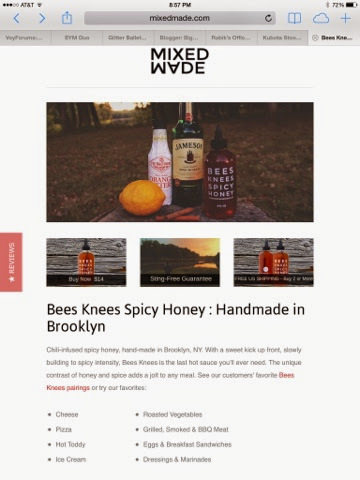 The Bees Knees Honey- great name! None of the holiday fare will make my fat cells shrink, though!